Edward George “Ed” Ankerholz, 95, of Lyons, passed away March 19, 2019 at Good Samaritan Society, Hutchinson, Kansas. 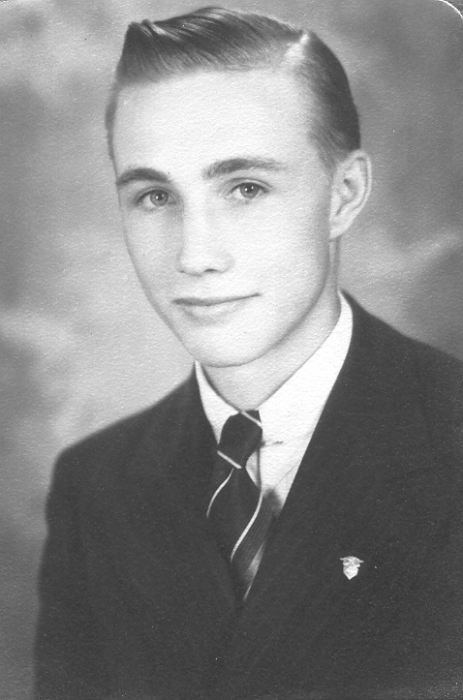 He was born October 18, 1923 in rural Chase, Kansas, the son of Henry and Lena Blank Ankerholz. He graduated from Chase High School with the class of 1941. Ed was a near lifelong rural Chase resident. He was a farmer and oil field truck driver. Ed served in the United States Army during World War II, from February 13, 1945 until December 2, 1946. He was a member of Salem United Methodist Church, Bushton, KS, and was a past trustee for Pioneer Township. On December 16, 1956, Ed was united in marriage with Geneva Finch in Lyons, Kansas. She preceded him in death on April 2, 1994. He is also preceded in death by his parents; brother, Richard Ankerholz; sister, Irene Kennedy; step-brothers, Lawrence “Larry”, Herman, and Lloyd Ankerholz; and step-sister, Katherine Burns. He is survived by his three children, Lance Ankerholz and wife Staci of Topeka, KS, Dirkson Ankerholz and wife Jennifer of Clearwater, KS, and Dimity Rogers and husband Clint of Ellsworth, KS; six grandchildren, Kylie Briggs and husband Matt, Kelci Ankerholz, Keenan Ankerholz, Hayden Rogers, Dalen and Kendyll Ankerholz; great-grandson, Everett Briggs; and sister, Joyce Cheuvront. Funeral service will be 11:00 A.M., Saturday, March 30, 2019 at Birzer Funeral Home, Lyons with Pastor Larry Schumacher officiating. Burial will be at Lyons Municipal Cemetery with military honors by Ft. Riley Honor Guard. Memorials may be given to Salem United Methodist Church in care of Birzer Funeral Home, Lyons.